Inquiring minds want to know why we too should befriend KM Typo! Want to friend KM Typo? You need to log in or join our community, first! It's fast, free and easy. Small, but not too small...not that being only an inch or three under average height does her much good when she’s standing next to her peers, many of whom are hulking masses of ropey muscle and hate, or otherwise closer approaching the standard for ‘intimidating criminal bikers’ than herself. But one would be unwise to underestimate the girl due to stature or apparent youth, a spattering of freckles across a fair-featured face that nevertheless can not conceal the glint of reckless abandon in eyes that might have been forged of iron. Not quite insane, but somewhere in that general vicinity; around where the dividing line between ‘socially acceptable’ and ‘unhinged wild animal’ grows blurry and indistinct. * The kind of girl as quick to pull some ridiculous stunt just for the rush as to start a fight by issuing the first, unexpected blow. The kind of recklessly irresponsible delinquent with little regard for her own safety, or the safety of others. The kind of girl that there’s something just off about her but it’s impossible to put a finger on. Cleverer than she looks, yet can’t ever seem to give anyone a straight answer on anything. Generally can’t take anything seriously, takes blows in stride with good humor and always hops back to her feet with a spunky grin when she’s knocked down. She also has a passion for questionable music choices and alarmingly bad dancing. But at least she can sing. Aesthetically the girl isn’t all that dissimilar from one’s average picture of a rough-and-tumble criminal biker chick. A sort of barcode is tattooed on the right side of her neck. Her hair, light blonde and dyed with a pale blue about the unruly bangs and in scattered streaks of color, is almost always worn in a pair of low-hanging, shoulder-length pigtails; a style which, depending on one’s perspective, is either perfectly fitting or utterly ridiculous. Skin on the paler side, the light tone rather complimenting the battered, but very well-made leather jacket without which she - nor any other of the Raiders - she is ever seen. The jacket, custom-tailored with red trim and a myriad zippers, was issued upon initiation into the dangerous gang - and as a rule the only thing more precious to a biker than their gang jacket is their bike itself - of which the girl who goes by ’KM’ is no exception. Stitched into the back and the left lapel is the notorious insignia of the Raiders of Lost Grace, where on the opposite breast is stitched the girl’s chosen alias, ’Typo’. Despite her comparatively diminutive appearance against that of the rest of the gang and her generally upbeat attitude, her peers are as a whole in agreement that she is not one to be trifled with. Wildly unpredictable, Typo can go from jovial and chipper to disturbingly violent or manically furious and back in the blink of an eye. Her weapon of choice is her trusty brass knuckles, usually stowed in her pocket within easy reach, with which she will not hesitate to brutalize anyone she feels might deserve it. She is also known to wield a metal baseball bat and, as most of the Raiders, is armed with a sleek, multi-function directional energy weapon strapped to her left forearm beneath the jacket. 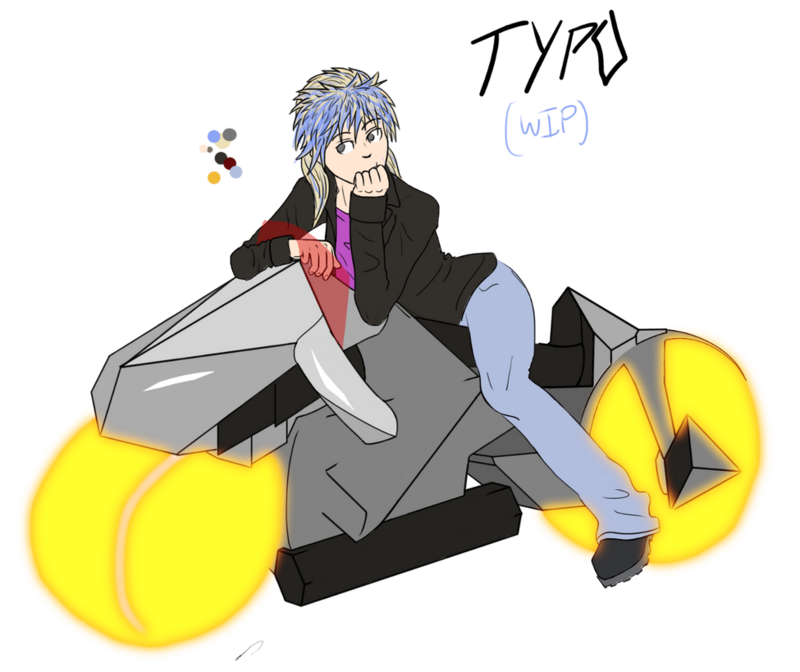 KM’s hoverbike’s name is ’Bike’. An older, outdated model rarely seen among the myriad ranks of biker gangs inhabiting the Capitol City - and some sort of custom job at that. b-1k3 is printed in faded lettering on the hull, but the designation is meaningless and there are no other identifiers. It was probably the very top-of-the-line, cutting-edge of its time and well maintained as it is, the machine can easily keep up with even the fastest modern bikes - provided the rider is skilled enough. Composed of various shades of gunmetal grey, the body worn with the infinitesimal scuffs and scratches that looked more like a sort of venerable patina than actual damage. Unlike modern hoverbikes, Bike features an aesthetic long since gone out of style in the form of exterior propulsion generators at the front and rear which glow brightly and give off the impression of having wheels. But far from just for show, Bike sports a unique function which KM refers to as ’kinetic overdrive’ that most bikers in their right mind would hesitate to actually use even if they could. By bringing the ‘tires’ into contact with a tangible surface - the ground, water, even walls - the machine can reach a truly irresponsible velocity. This makes up for the outdated mechanics, but requires a pilot both skilled and insane enough to maintain such a small distance from obstacles while moving at ridiculous speeds. Bike is also unique in that it is sapient. While ‘sentience’ is debatable, there is no denying that the machine has a mind of its own. When not being ridden, it will follow KM around like a loyal pup unless explicitly ordered to do otherwise - and even then the order is not always heeded. While it does not speak, KM regularly talks to it as though it was talking back, despite this absolutely not being the case. Often doing things on its own, Bike will wildly buck like a raging bull in order to throw off anyone that isn’t KM attempting to ride it, and usually - but not always - responds in some way and another to its name. Bike has also exhibited an extreme protectiveness over KM and has been known to brutally murder people should it determine that KM is in danger. This is typically accomplished by the machine blasting out of nowhere at irresponsible speeds, bowling over the target and subsequently reducing them to a gory smear on the ground. It has also on several occasions fallen out of the sky to crush attackers, and once used Kinetic Overdrive on an assaulter’s face - which was gruesome enough that even KM couldn’t eat for several days. Luckily for Typo, Bike is virtually indestructible for reasons as of yet undetermined. Between this and its tendency to brutally murder people without warning, KM's Bike is easily far more dangerous than she is.  There are few criminal organizations more notorious than The Raiders of Lost Grace MC. A comparatively clandestine group in comparison to other gangs, the Raiders do not sport a large public presence - but they are very well known and respected among the organized crime rings and rarely trifled with. Territory marked with their shackled hand insignia is disputed only by the occasional fools or newcomers. They are no strangers to violence, as ruthless as any such band of brigands must be, and willing to use whatever means necessary to accomplish their goals. They are often above the law due to corrupt officials with well-lined pockets. The Raiders dabble in most forms of lucrative criminal activity, namely drug trafficking and illegal cybernetics - but the reason for their notoriety is reflected in their insignia - the shackled hand, which has made them also unofficially known as The Chain Gang. The Raiders have a particular talent for making people disappear - but calling them 'assassins' would be a greivous discredit.